In this study, neutron production characteristics were investigated by employing three different anode designs. Previously, Takao et al. 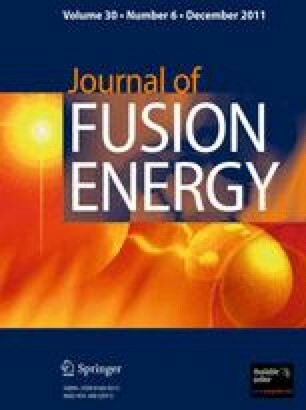 in Plasma Sour Sci Technol 12:407, (2003) studied the effect of anode design on the production of impurity ions in a dense plasma focus (DPF) device. It was found that rod type anodes led to large quantities of impurity ions, resulting in an ion purity of only 25%. In contrast, in hollow type anodes the quantities of impurity ions is strongly reduced, resulting in an enhanced ion purity of 91%. These impurities in the DPF system originate partly from residual gas in the vacuum system, but also from vaporization of the anode, which produces metallic ions such as copper. In the present work, we extend previous investigations Takao et al. in Plasma Sour Sci Technol 12:407, (2003) of the effects of anode shape (A—long hollow, B—short hollow and C—rod type) on neutron production. Here we focus specifically on the effects of anode impurity on neutron production. It was found that in anode type C, the neutron intensity and neutron yield is lower than in type A or B.